Baseball is back! Check back here throughout the day for updated blurbs as teams confirm their lineup. We’ll keep you updated on some of the day’s highest-impact trends by utilizing our Models and Vegas dashboard. 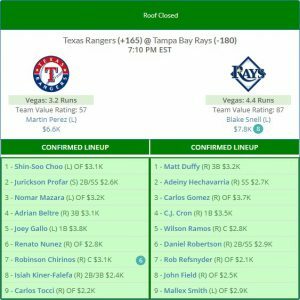 Projected and confirmed lineups for every game can be found on our MLB Daily Lineups page. Josh Harrison was diagnosed with a fractured left hand after being hit by a pitch on Sunday, and he’s expected to miss six weeks. In his absence, Adam Frazier will draw a majority of the playing time against right-handed pitchers, and he’s in the lineup hitting leadoff on Monday. The Pirates are currently implied to score 4.3 runs but suffer from playing at home, as PNC Park carries the fifth-worst Park Factor rating in Monday’s slate. While Frazier carries dual-position eligibility on DraftKings (OF/2B), his $2200 salary on FanDuel offers an exceptional value for a leadoff hitter. Gregory Polanco is the highest-rated Pirates hitter on both DK and FD in the Bales Model, and he has managed to hit a team-high 50% flyball rate over the last 15 days. Kevin Kiermaier is slated to undergo surgery to repair a torn ligament in his right thumb, and he’ll be replaced in the three-hole the lineup by Carlos Gomez and in the outfield by rookie Josh Field. Matt Duffy will bat leadoff as he customarily does against left-handed starters, and he costs no more than $3200 on DraftKings and FanDuel against Martin Perez, who has yielded the third-highest recent batted-ball distance and a slate-high 58% recent hard-hit rate. Cheap leadoff hitters with a negative wOBA differential have historically averaged a +0.93 DraftKings Plus/Minus with a 47.6% Consistency Rating. In Duffy’s case, he’s averaged 9.33 DraftKings points in three previous chances this season. Anthony Rendon and Brian Goodwin remain sidelined due to various maladies, and they’ll be replaced in the lineup by Matt Adams, who will bat fifth, and Wilmer Difo, who will bat seventh. Goodwin will be available to pinch hit, according to manager Dave Martinez, and Rendon is slowly improving. Their absence improves the appeal of Mets’ ace Jacob deGrom, who is among the highest-rated pitchers in the Bales Model and opposes a team presently implied to score 3.3 runs. The wind blowing out firmly to right field may be an issue for deGrom as the Nationals have two lefties and two switch-hitters in the lineup. 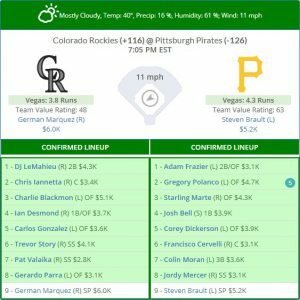 When pitchers with a similar opponent implied total, humidity factor, and wind speeds to the outfield have taken the mound, they’ve averaged a -1.99 FanDuel Plus/Minus in seemingly beneficial hitting conditions. However, deGrom has averaged 59.0 FanDuel points in three such starts. Yoenis Cespedes will receive a routine day of rest, and Jay Bruce is out of the lineup for the second straight game. Bruce admitted to dealing with lingering pain in his foot, but he should be available to pinch hit and said he’ll be in the lineup on Tuesday. Brandon Nimmo will bat leadoff and Juan Lagares will move into center field with Michael Conforto shifting to left. In Nimmo’s limited but recent at-bats, he’s made solid contact, and he ranks second on the Mets with a 0.386 wOBA against right-handed pitchers. Nationals starter Jeremy Hellickson will make his season debut, and over the past year, he’s allowed the highest HR/9 rate (2.11) among starters on the main slate. 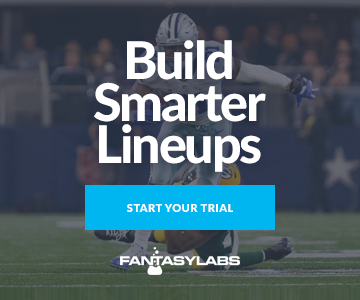 He also carries the second-lowest year-long SO/9 rate (5.65), and a four-man Mets stack is among the highest-rated combinations on FanDuel and DraftKings in the Bales Model. Cesar Hernandez will receive his first day off this season as Scott Kingery has established himself as an everyday player. Kingery is making his seventh consecutive start and has already played at five positions this year. Manager Gabe Kapler has deployed a different starting lineup in each game so far and Nick Williams is once again the odd man out on Monday. Kingery remains in play on both DraftKings and FanDuel with a FantasyLabs’ +6.0 FD Plus/Minus over his last 10 games. The Phillies offense suffers from a 27th percentile Weather Rating but are currently implied to score a respectable 4.3 runs. Opposing pitcher Julio Teheran has struggled with his command this season by walking 10 batters in his first three starts while allowing four home runs. Ryan Braun will miss his second consecutive game on Monday due to a tight back while Eric Thames is out of the lineup after suffering a strained left adductor on Sunday. Jesus Aguilar will replace Thames at first base in a rare start against a right-handed pitcher, and Hernan Perez will once again enter the lineup in left field. Even with worse splits against righties, Aguilar still holds the team’s third-highest ISO percentage and makes for a viable tournament option on FanDuel, where he carries an 82% Bargain Rating. 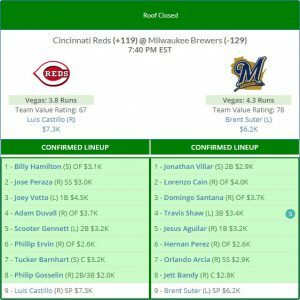 The Brewers implied run total has dropped by 0.4 runs since opening at 4.7, and opposing pitcher Luis Castillo leads all starters with 8.4 projected strikeouts.